Starting from € 370,00 per person. Based 2 people. 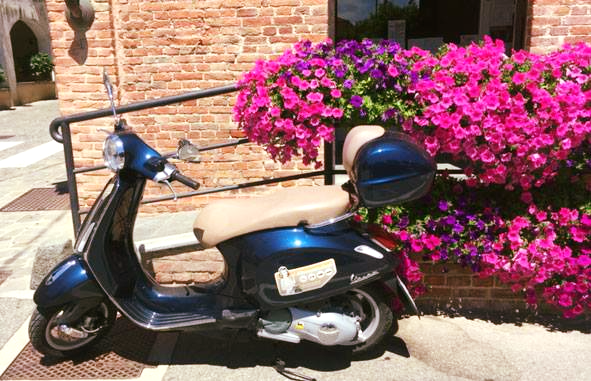 Discovering Langhe and its vineyards, villages and wines riding a Vespa! An Italian hit of a few years ago sang: “How nice it is to go around with the wings to the feet / if you have a Vespa Special keeping the problems away …”. Nothing could be more true! A “two-wheels” is perhaps today the best way to discover a territory too big to be visited entirely walking, but too small for cars or big vehicles like buses. So we thought to create a 4 days tour, moving by Vespa 125 and visiting the nice town of Alba, the capital of the Langhe and the surrounding hills, along the most panoramic routes winding through the area of production of the famous wines. The tour starts from Barbaresco area, where the great homonym wine is produced. Barbaresco wine is well appreciated all over the world and it’s cultivated in a portion of very small but beautiful territory (only three Municipalities): Neive, awarded as one of the best villages in Italy, Barbaresco built overlooking Tanaro river, hosts an ancient panoramic tower, Treiso where a roman emperor was born (Publio Elvio Pertinace) and where some of the most famous and cruel pages of the partisan struggle have occurred, as the pages of the great writer Beppe Fenoglio testify. Now you arrive in the Barolo area, that no needs any presentation! Just the tour through the castles and the vineyards, between the famous wineries and the fantastic taverns (or sophisticates Michelin star restaurants) gives a great importance to your trip! We are in one of the world’s temples of food and wine and high quality accommodation: and it’s all here for you! Finally a visit in two areas wrongly considered marginal: Dogliani, a town full of artistic heritages and country of the Dolcetto Docg wine, and Alta Langa, which, alongside its ancient vocation for cheese and hazelnuts, is now interested in viticulture in its less part, from which it is now possible to obtain excellent sparkling wines with Champagne Method. Two areas to be followed faithfully, to finalize an interesting and stimulating journey, driving a Vespa, with the sun in front and the wings on your heels!